Careful, Bart. You might break my calculator… by which I mean my head! Set fence posts and a pergola in the ground. There always comes that point where you have to work out how many bags, or cubic yards, of concrete you need. I usually do a bit of mental arithmetic to calculate the volume I need to fill. This is normally only a very rough estimate, and always involves erring on the side of caution initially, and then having to go back to buy more. That’s really fine. But it would be nice to be able to estimate my concrete needs more accurately. And, if you are ordering ready mixed concrete, you really need to calculate the volume much more precisely. So, I’ve been looking around the webosphere for help. There are a lot of online concrete calculators out there, and their utility and quality vary dramatically. Some are thoughtfully designed to be as useful as possible. Others are quite basic, and not really very helpful. Some of the websites with the less useful calculators have other good information, but I’m only going to cover calculators here. those that work out how much the material will cost. Here, I’m going to focus on the first kind, but some of the ones that are better at calculating material will also calculate cost if you want them to. Making a base or pad. There are many online calculators that are made with one of these scenarios in mind. After sorting through them all, I am in a position to recommend the most appropriate calculator for you to use in each of these situations. I will begin with the simplest: a base or pad. 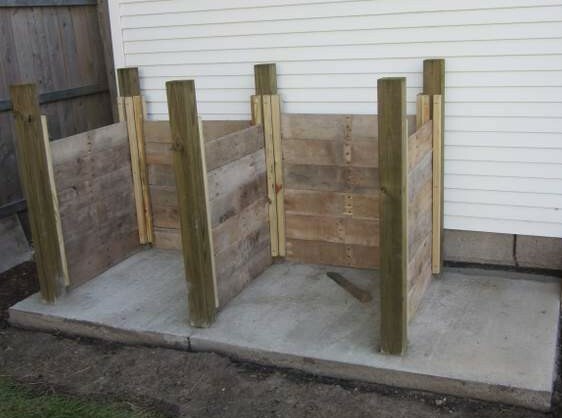 We made this concrete base for compost bins. 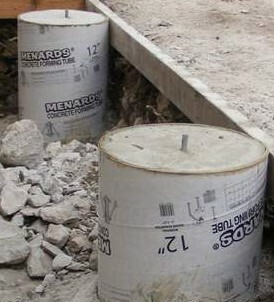 Often, you will want to lay a concrete base that is a few inches thick. There are many online calculators that will help you work out the amount of concrete needed for such a job. For a simple, rectangular slab, Lowes has the most useful calculator. It will work out how many bags and cubic yards of concrete you need. For a more a complicated slab with right angle corners, such as ‘L’, ‘U’ or ‘H’ shapes; use the BlockLayer.com calculator, leaving out the edge foundation and internal foundation information. If your slab is a circle, triangle, hexagon, or octagon, the Home Advisor calculator is the one to use. You first choose the shape, then it prompts you for the dimensions it needs to calculate volume. However, it only tells you the number of cubic yards. Use our Concrete Bag Calculator to calculate the number of bags. You can find extra information about my favorite calculators in this table. Number of 40 and 60 pound bags. Number of 40, 60 and 80 pound bags. I hope you found some of that useful. Next time, I’ll find you some calculators for other types of concrete projects. This entry was posted in Calculators, Construction, Outdoor Building Projects, Porch, Repair & Maintenance, Walls & Floors, Yard & Garden and tagged arbor, calculator, concrete, fence. Bookmark the permalink.